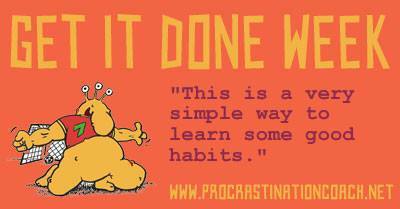 People who procrastinate tend to want to hide it. Many people are ashamed of their non-productive behaviour, and don’t want other people to know about it. Which is very understandable. Unfortunately, it doesn’t help. It might even make it worse. Nobody likes to hide in shame, so the feeling invites distracting activities. Like watching funny clips on Facebook. Or checking your e-mail for interesting messages. Or playing a game on your phone. Anything that makes you think of other things. In the mean time, the work doesn’t get done. And the bad feeling secretly doesn’t go away. It just hides – to pop up later and ruin another day. One way to step out of this vicious cycle is to pair up with somebody who get things done. Pairing up can be done in many different ways. You can create a work date for example, and agree to work next to each other for a couple of hours. Or agree to e-mail each other at set times, sharing what you got done. Or work together with them, and have them send you things that you will work on. I picture you worrying that this won’t work. That you’ll only compare yourself to them, and feel worse. That could happen, I agree. So you may need to prepare your mindset for this. Talk to yourself that you don’t have to be as productive as they are. They are a different person, leading different lives and doing different things. Your aim will “just” be to end the vicious cycle. To get more done than you did before. To grow your belief that you can get things done. Even work that’s difficult for you. Remember: your productivity partner is your support, not your idol. And yes, I needed to pair up with a productive person to get this post written. I tend to procrastinate at marketing. But my desiger send me some love banners, that I wanted to use straight away. It was all the motivation I needed. Wonderful advice! Getting things done and procrastination is one of my biggest challenges as a writer and business owner because I don’t have a boss to tell me what to do. I know what you mean Tobi, I’v struggled with that too (and still do some days). Have you found some ways that work for you? 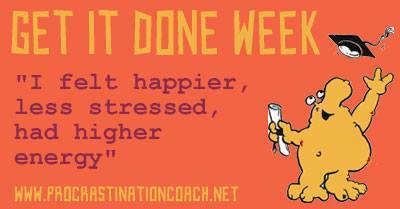 For me it turns out that taking real breaks and providing rest is something that makes everything work better. It took me quite a while to discover that, because both my work ethic and my enthusiasm were blocking the view. 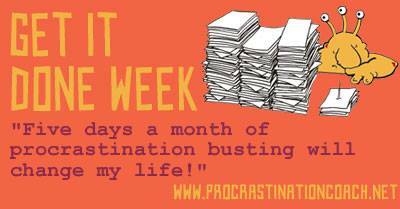 I like your way of putting it: releasing the procrastination. Most people tend to fight it, which often makes it worse. Or drains a lot of creative and productive energy.